We had our second race on June 8th. The car had run so well at the May race, that we decided to only make one small change for the June race. We lowered the gear ratio to get the engine to a little higher RPM. We did all the usual Saturday stuff, getting the car inspected, setting up camp, doing the course walk, and getting the association timing equipment ready. With so little on the car that needed doing it was actually pretty leisurely. That was a good thing because it was HOT. 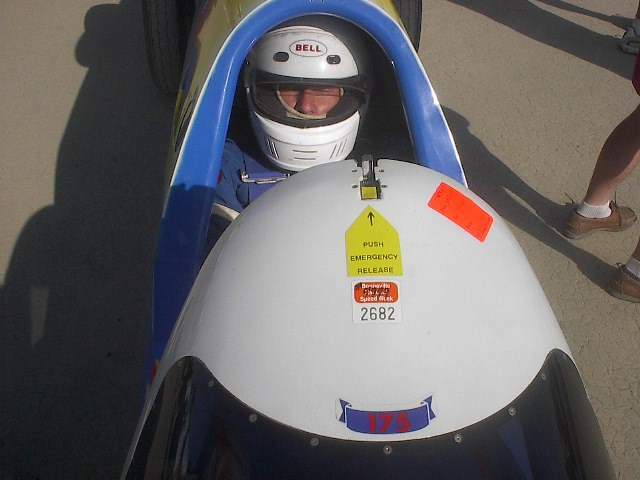 One thing we did that we'd put off for a long time was putting the name of our biggest sponsor on the side of the car. It's a good thing they're very understanding people. 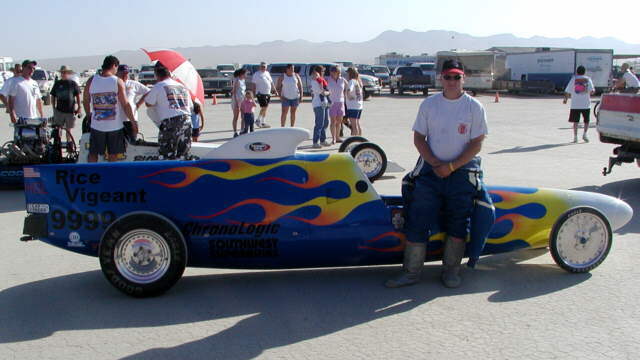 For those of you who don't know, Alan and I own ChronoLogic, the company that supplies the clocks for Bonneville. We use the proceeds to help pay for the car. Southwest Superbikes are the guys that are loaning us the 1390cc Hayabusa that's loaded inside. Sunday morning, Mark was driving, and since we were 11th in the association, he ran very early in the race. Well, it looks like we out guessed ourselves because he only got 175.75, but wanted 179+ . We later determined that we had gone too far with the RPMs and got past the torque curve. But it turned out that very few people set records that meet, only about 5 or so, with the overall result that we actually moved up in the standings to #6 for the association. If we can get a record next meet, we'll be in a great spot for the second half of the year, when we run our new and improved motor. In the mean time, we are working this weekend on building a better air intake to make better use of the fantastic scoop we got from Composite sports in Fullerton. The next race is July 13th. If you are planning to attend, bring plenty of water and shade, it will be very hot. PS: our faithful push truck (actually a Nissan Pathfinder) that can often be seen near the racecar just turned 1/4 million miles!